Last night, I was fortunate enough to go to a free screening of “The Grand Budapest Hotel” and witness a Q&A following the screening with Jeremy Dawson a producer on the film who has worked with Wes Anderson, the director of the aforementioned film, on several other films as well. For those of you who don’t know what “The Grand Budapest Hotel” is or who the heck Wes Anderson is, let me enlighten you. This movie contains within it three stories. The most important and lavish story, is the one that contains young Zero Mustafah, played by Tony Reveolori, who is the Lobby Boy for the hotel and M. Gustave, played by Ralph Fiennes, who is the concierge for the hotel. These two meet after M. Gustave has an unusual encounter with Madame D., played by Tilda Swinton, who appears to believe that her life is in danger. What befalls after that includes an advernture involving a henchman, played fantastically by Willem DaFoe as Jopling, and includes Dmitrie, Madam D.’s son, played by Adrien Brody and a long cast containing Harvey Keitel as Prisoner inmate Ludwig, Jeff Goldlbum, as Deputy Kovacs, Edward Norton as Police Chief Henckels, Bill Murray as M. Ivan, Owen Wilson as M. Chuck, and Jason Scwatrzman as M. Jean. Without spoiling the entirety of this brilliant picture, this movie is about love, humanity, and courage in the face of danger. But, you may ask, isn’t just about every movie about something like that? Why, yes it is. However, this movie is also immensely funny and I believe one of the best, if he were to die today, I would say the best We Anderson movie out there. 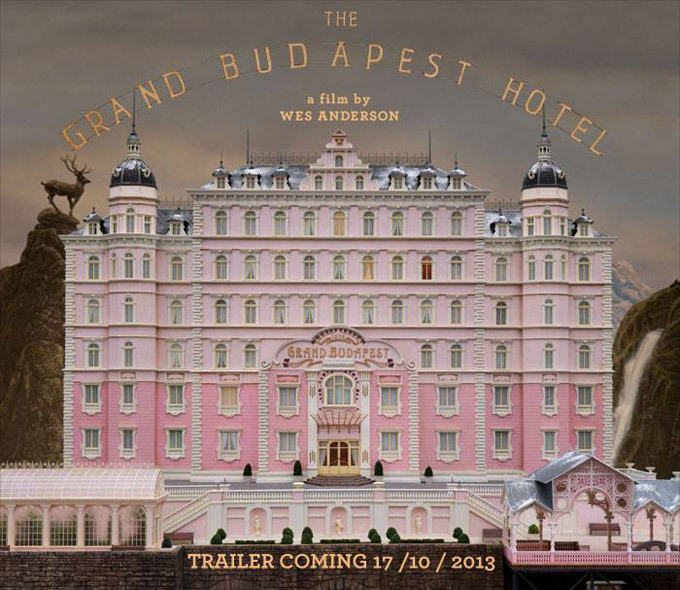 Who is Wes Anderson you ask? Well he’s a director known for his unusual oddly humorous characters, intense color schemes, fantastic set designs, and mixing humor and drama quite effectively. He’s directed such works as “Rushmore”, “The Royal Tenebaums” and my personal favorite, second, of course to “The Grand Budapest Hotel”, “Fantastic Mr. Fox”. Mr. Anderson bits and pieces from his prior films to make something authentic and worth seeing in “The Grand Budapest Hotel”. The set design for this movie was fantastic and outrageous. The chandeliers, the alley ways, the bakery shop, were all incredibly done and done with such detail. There was also several uses of stop-motion animation throughout the film that were hilarious but still kept the story moving. Revolori and Fiennes were fantastic and I guess what really drew me to enjoying this film was that I liked their relationship. I didn’t care for many of the characters in both “Rushmore” and “The Royal Tenebaums” and maybe I wasn’t supposed to but Zero and M. Gustave I enjoyed. I wanted them to succeed. I am also a sucker for a good adventure and “The Grand Budapest Hotel” was exactly that. From prison breakouts to infiltrating a priest hood, Zero and M. Gustave had an adventure that they surely will not forget. “The Grand Budapest Hotel” contains the best parts of any Wes Anderson film and it is one that I think people everywhere should watch. P.S. Also, just something funny to note, the producer revealed to us that Harvey Keitel was so intent upon nailing his prison inmate character, that he spent the night in the East German prison that they filmed it, because, well….he wanted to. There was no heating, no lights, just blankets and warm bodies. Just Harvey Keitel and a few German extras spending the night in an old East German prison. No big deal or anything. Heh, of all the movies for Keitel to spend the night in a prison to get ready for the role is one that required him to basically sit in a room and not even change his accent. Loved this one too.